After a disappointing loss last night in Knoxville, the Wildcats need a major resurgence to get back on the right track. What better way to energize the team than to get the Big Blue Nation involved? Kentucky men’s basketball called out to the BBN to help the team in their massive game against Texas A&M on Tuesday night at 7:00 p.m. Your job? 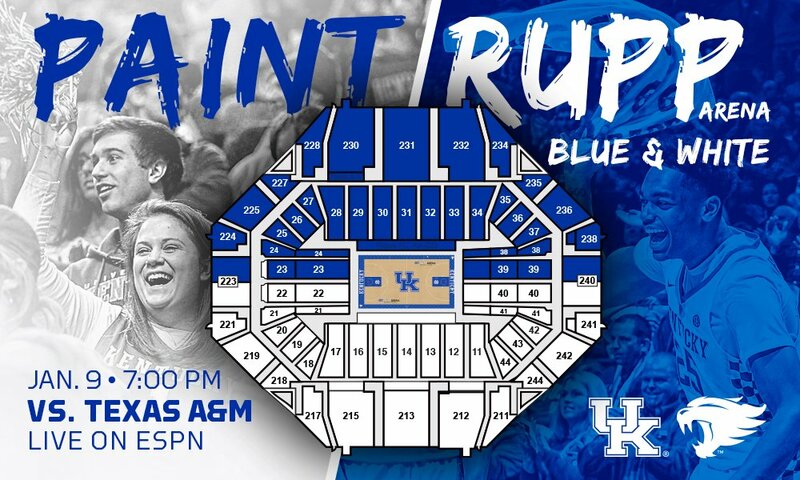 Paint Rupp Arena blue and white. Find your section on the seating chart and wear that color on Tuesday night. It’s that simple. Tell your friends, family, and anyone else you know that will be in attendance. Get loud and create a crazy atmosphere at Rupp Arena. The team needs it. Please ESPN: No Duke Vitale. Don’t we make fun of other schools for doing this? Only those who do it every single time UK comes to town. We are UK. We don’t do that stuff! Oh, yeah. Who is the opponent? Don’t legitimize them. Make them earn their respect the hard way.